﻿The New Mexico Search and Rescue Council promotes the advancement of training in the various disciplines involved in the field of search and rescue. Our member teams cover a broad spectrum of specialties related to SAR, and we believe that, as an organization, it is important to capitalize on the training expertise of the NMSARC member teams and the greater New Mexico SAR community. The Council invites member teams to host training events throughout the year. To encourage diverse and widespread participation in such events, member teams are encouraged to actively engage in the hosting, coordination and facilitation of SAR training missions. While member teams would be considered as the primary hosts, the NMSARC Board is available to serve as a sponsor for statewide and regional training events. Trainings will be posted under Events along with information on prerequisites, registration, and cost (if any). Department of Public Safety-sponsored trainings, including field certification and section chief courses. In addition DPS sometimes subsidizes other specialized training (e.g. tracking). 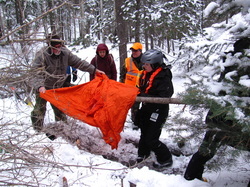 NMSARC-sponsored training, much of which occurs during the ESCAPE conferences. Multi-team and/or multi-agency trainings, often designed as mock missions. Be an active member team of the NMSARC. Obtain a state Training Mission Number from the Search and Rescue Resource Officer. Submit a Training Request (complete and submit the contact form below), including a description of trainings you are willing to offer. Event sponsorship and advertising via internet mediums such as the NMSARC website. Training instruction, consultation and/or guidance at any stage of the process. This may include acquiring specialized instructors, establishment of an Incident Command staff , evaluation of training plans, logistics, or operations, acquisition of special resources, etc. Financial assistance (i.e. seed money) to get the event started. This would be in the form of a loan that would be repaid to NMSARC after the event. If you are interested in being added to the NMSARC's new Training Directory as a volunteer trainer, please complete and submit the form below. The information you provide will help member teams interested in training determine the extent and focus of your background. We will post the document on the NMSARC website so that member teams can locate experts in their region. The basic goals for the project include: 1. more frequent and specific trainings for member teams and 2. the bonding of our SAR community.